Those of us who don’t play an instrument might not consider ourselves musically gifted, or be inclined to lend a hand to teach others, but volunteers like Julianna Salinas cross those boundaries without a second thought. Although Julianna may not be a music major at HSU, she has shown talent in other areas like mentoring kids with North Coast Music Mentors, a newer YES program she recently took over. As a mentor, she has seen children become more interested in music and has personally guided groups of children (and herself) into becoming more rhythmic people. She now plays at “bucket band”; an event where children of all ages can come and play drums on discarded buckets. These kids do not have to worry about anyone judging their skill, and they are allowed to be as silly as they want! As a director, Julianna and her volunteers provide these youngsters with positive role models who are always there when they say they will be, and commit time to the kids. Some children would not have access to a resource like these mentors without NCMM. 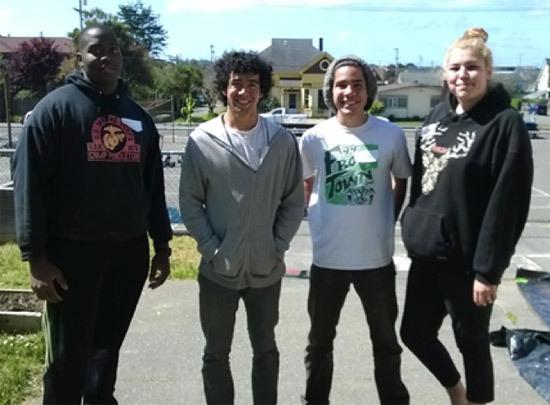 North Coast Music Mentors volunteers at this year’s annual Serve-a-Thon.